The second phase of the project builds upon phase one to engage patients, policy stakeholders, system leaders, and other parts of the NHS. Investigating three critical areas that emerge from phase one. First, to develop a model to inform the design of work tasks of healthcare professionals. Second, to identify design guidelines for human-machine interactions. Specifically focused on what kinds of workflows should be preserved for human workloads. Third, to investigate the potential impact of automation on the patient experience with their GP. The mission of this phase of the project, of which Dr. Willis is the Principal Investigator, concerns what kind of work should or should not be automated given the culture and social norms of Primary Care. To better understand questions such as: what tasks are personally fulfilling and rewarding, when tasks are automated how can that occupation be redesigned or reconfigured, what does this kind of automation mean for patients, how would automation technologies impact the patient-provider relationship, and in the face of removing tasks that are automated what new tasks can be introduced that add value to primary care? Need for this research is not only supported by our previous findings from phase one that demand further investigation, but this phase also connects to the areas of importance and high impact as identified in the following reports: The General Practice Forward View, NHS Five Year Forward, the RCGP Spotlight on the 10 High Impact Actions, and the Nuffield Trust briefing on digital requirements for new models of care, to name a few. RCGP highlights in their report 10 high impact actions, there are two specific actions that this project will address: productive workflows (#8) and quality improvement (#10). This project will pursue questions about how occupations might be reconfigured to impact productivity, value, and quality. In the NHS General Practice Forward View two relevant areas are workload and care redesign. Concerning workload, the forward view cites a study commissioned by NHS England that calls for a reconfiguration of general practice workload, and ways to release time for additional patient interactions. Also mentioned are the automation of common tasks and the redesign of models of care. Although not explicitly listed in the Forward View there is an obvious need for understanding the patient experience in a practice that employs automation technologies. Raising the key question of how patients are treated, and how care can be redesigned, when more tasks are automated that impact the patient-provider relationship. The Nuffield Trust has two publications that address patient engagement and technology: the first Digital requirements for new primary care models; and the second Developing care for a changing population: patient engagement and health information technology. The first briefing makes clear that patients will be more empowered through the development of new online information portals, peer support groups, and other ways information technology will provide resources and information to patients. The second discussion paper states patients should be part of the design and implementation process of these systems. We posit that patients will experience change, both helpful and a hindrance, from automation technologies. The two Nuffield Trust publications make clear, further inquiry into automation impact and implementation into primary care must involve the patients experience and voice. Furthermore, The Nuffield Trust briefing on the digital requirements for future models of primary care discusses the challenges facing primary care that may impede progressive digital transformation. One such challenge is that change “requires significant staff time for change management, training and embedding new processes. Organisations must invest resources to free up time for clinicians to focus on strategic objectives and develop plans to ensure staff engagement and commitment”. This research intends to provide evidence on where time can be freed up to prepare for the implementation of new digital systems and workflows, and what those workflows may look like. This second phase operates under the following thesis: if more time is made available to practice staff through help from automation, what other activities and tasks can be added, extended, or modified that increase value and improve quality for the practice and its staff. 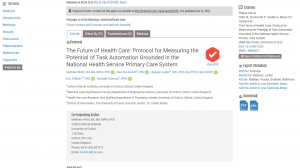 Subsequently, how might automation increase the complexity of the work that must be performed in primary care? RQ1: How will primary care occupations change if tasks with a high probability of automation are removed from their workload? RQ2: How can tasks and work processes that cannot be automated have their quality improved, or otherwise add value to primary care patients and staff? RQ3: In what ways will patients be impacted by the automation of high probability tasks in primary care? In addition to traditional academic outputs: talks, conference proceedings, journal articles, and public scholarship, this project will culminate in a publicly available technical report that details the project and outcomes. In addition to the final report, the project intends to generate impact by developing policy reports and public facing documents for an audience of system leaders, policy actors, and NHS stakeholders.